So it was in 1898 that a group of Irishmen came together to form their own club, the London Irish Rugby Football Club. The founding fathers were an exceptional group of powerful personalities embracing politicians, lawyers and businessmen united by a sense of Irishness and passion for rugby. From the beginning London Irish was to provide a welcoming “home” and hospitable meeting place for all Irish people, regardless of creed or politics. Fortunately for the founding father their inspiration off the field found equal inspiration on it through the arrival in London at the time of veterinary surgeon, Louis Magee, a leading Irish international. Magee represented Ireland 27 times between 1895 and 1904 at out-half. He was a vital recruit for London Irish and attracted others of his countrymen to the new club. Louis Magee’s presence together with that of the club’s first captain R S Dyas, was to have a major impact on progress. Such was their influence that regular fixtures were soon arranged with most of London’s leading clubs of that era including Blackheath, Rosslyn Park, Saracens and Wasps. A decade later London Irish was firmly established. Of 28 matches played in the club’s tenth anniversary season there were 15 wins and 13 defeats. 1911 saw the club’s first foray into Europe, to France for a game against Le Harve. Sadly, it would not be long before London Irish members would be crossing the Channel for altogether different reasons that were to impact on the club. Irish rugby was to be affected badly not just by the two World Wars during the first half of the last century but also by the Easter Rising of 1916 in Ireland. Many of the club’s members were among the soldiers of the Irish Regiments that lost their lives in the 1914-18 war. By the late 1920s the club boasted its first “home grown” Ireland international in a mighty forward, S J ‘Cags’ Cagney who won 13 caps in the green jersey between 1925 and 1929. This decade saw the inauguration of regular fixtures against great clubs such as Leicester and Cardiff. Cagney was captain of the club in the 1928/29 season when it did the double over the other two London exiles clubs for the first time. Another link with Leicester at this time was the created by Cecil Beamish, a son of the famous Cork-based brewing family, who played for the Midlands club before transferring to London Irish in the early 1930s. Cecil’s older brother George also joined London Irish in 1930. He was a big man not just in stature but also in personality. He was to become captain of Ireland in 1932 and was to go on to become a famous Battle of Britain pilot in the Second World War. Few matches were played during the war between 1940 and 1945. Many London Irish players found themselves in services’ teams in far distant places. Nine of the players that played for the club in the 1938/39 season lost their lives and others never returned to England. London Irish’s itinerant existence impacted adversely in playing and social terms so the club’s officers decided that if their ambitions were ever to be realised the club needed a home of its own. Such was the state of the grounds after the War that the Club had no choice but to abandon Sunbury temporarily and continue to play its first team rugby at the Rectory Field in Blackheath. The club’s fortunes were to change dramatically in the following season as key players joined including a new captain in Des O’Brien, one of the great back row forwards of his time. He went on to manage the 1966 Lions tour to New Zealand. The first XV played thirty games losing only nine, winning 19 and drawing two to record the most successful season in the club’s history to date and a fitting way in which to celebrate its 50th anniversary. A bonus for the club was that four players – Kevin O’Flanagan, Jim Corcoran, John Daly and Des O’Brien played for Ireland in that season’s Five Nations. It was also in this remarkable season that London Irish decided that given the undeveloped state of Sunbury, it would be in the club’s best interest to combine with Blackheath and share the facilities at the Rectory Field in south-east London. As the 1950s dawned, the club was fielding six teams most weeks making it a thriving hub of London rugby with a growing reputation for the fun to be had off the pitch as well as the commitment and organisation on it. It was also at this time that the club began a schoolboys’ section that was to be important in the years that followed. In 1951 London Irish became the first club in Britain to host a touring Italian team when Roma came to town and played at Blackheath. Indeed the early 1950s saw a host of great rugby teams coming to Rectory Field to play either Blackheath or London Irish. The only problem from an Exiles’ perspective was that the club was split in two with the junior teams using the steadily improving facilities at Sunbury and the senior team playing in the south-east of the capital. Andy was one of three famous members to play for the Lions during the mid-fifties – Robin Thompson captained the touring party to South Africa in 1955, the other was a certain A J O’Reilly of whom more later. It was also at this time that doubts began to surface about the first team’s residence at Blackheath. By 1957 Bill Morgan, the club’s formidable administrator, in his end of season review reported that the “committee have considered ways and means whereby our ground at Sunbury can be made into a first-class playing condition with a stand.” The decision was taken to return to Sunbury when the lease at Blackheath finished in 1959. A major fund-raising drive was launched to ensure some capital was raised as a down payment on the loans that would inevitably be needed to build the stand. The money was raised and Sunbury prepared for the return of the senior team. The final game was played at Rectory Field on 11th April, 1959 – a “home” victory over Old Merchant Taylors. The Sixties started at London Irish on 9th September, 1959 with a suitably “swinging” festive opening of the new facilities at Sunbury. That success and others were celebrated in the immortal Fitz’s Bar, an old wooden shed that once stood at the end of the ground. It originally served as changing rooms and a tea room, however it became the place to drink when the new stand opened. The bar was ruled over by Fitzy himself who tried to keep a happy, respectable house despite the best efforts of many over the years to compromise the reputation of his unique hostelry. The rest of the decade was a period of mixed fortunes for London Irish. There were good wins but many defeats, an inconsistency that belied the many talented players such as Mike Gibson, Tony O’Reilly and Ollie Waldron, who graced the Sunbury pitch. Famous opponents such as Coventry began to make regular appearances on the fixtures’ list. The Cup final team was captained by another great forward and Ireland international, John O’Driscoll, who was disappointed to loose that match – the club’s first ever appearance in the final of a national competition – to an outstanding Leicester side. In playing terms the eighties were another period of inconsistency. The first team struggled to find reliable form as work pressures made more demands on players’ time making them unavailable for regular training and matches. Happily, at the lower levels and socially London Irish continued to thrive. Among the most exciting developments was the advent of mini-rugby at Sunbury and the launch of a related tournament that continues to set the standard for similar events throughout these islands. 1985-86 saw the introduction of the John Smith’s Merit Tables in England and with them came a more disciplined approach to senior rugby. Michael Gibson, who ranks among the great Ireland No 8s took over the captaincy that season. Despite the arrival of other outstanding internationals like Hugo MacNeill, Brian McCall, Brian Spillane (an Australian), and Brendan Mullin, Irish failed to find any form in the new leagues and languished in the lower reaches of division two as the decade drew to a close. The harsh financial realities of playing at the top end of the game in England gradually became clear to all the country’s senior clubs including London Irish in the early years of the decade. Operating losses mounted and but for the generosity of key benefactors at the time, the club would have struggled to survive. The 1995-96 season was to prove to be one of the most eventful in the history of rugby union with the Rugby World Cup in South Africa providing an exciting and emotional curtain-raiser. The pronouncements by the sport’s ultimate ruling body, the International Rugby Board and the Rugby Football Union, on the crucial issue of “professionalism” at the start of the season, started a period of uncertainty about the future direction of club and international rugby. Prior to 1996, the club comprised three relatively autonomous elements: the first team, other adult teams, and youth/mini rugby. The onset of professional rugby in 1996 caused tremors and upheaval within the game and London Irish was no exception to this general rule. A critical event, which was germane to this very topic, was an EGM of the ‘old’ LIRFC on 27th June 1997, held in the Rose Room at Twickenham, when the members voted almost unanimously (13 against) to accept the offer from a consortium of London Irish business people to buy the club. The new entity, to be known as London Irish Holdings Ltd. (LIH), took over the debts of the old club in return for the First Division franchise plus the freehold of the club grounds at The Avenue, Sunbury-on-Thames. On the field the professional team relocated its games to the Twickenham Stoop. In order to release value, the board of LIH sought to secure planning for the redevelopment of The Avenue. This decision left the other sections of the club (adult and youth/mini rugby) in limbo. The consortium, understandably, had no interest in matters outside meeting the challenges faced by the professional side, as can be witnessed from their rejection of a proposal to organise the amateur section in November 1997. On Chris Kane’s initiative, John Gilligan, Steve Teague, and Bart O’Connell met to discuss bringing cohesion to the amateur area. They subsequently met with Gerry Gallagher, Michael Connole, Richard Smallbone, and John Flynn, who were organising the youth/mini sections, and then persuaded Alex Newberry, Gerry Holland, and Bosco McAuliffe to organise adult rugby. (1) These meetings can, in retrospect, be seen to be the instigation for the creation of London Irish Amateur RFC. All the named individuals remained as strong drivers in the formative years of the club. At a meeting in April 1999, it was stated that the Amateur Club would be moving to (a) finalise the arrangements for the amalgamation of the adult/junior sides and youth/mini section into one club organisation, (b) negotiate with London Irish Trading on details of the proposed Facilities Agreement for Sunbury, and (c) develop a plan for London Irish Amateurs RFC to operate Sunbury as a discrete operation. They were assisted in this by two men who held pivotal roles in the professional club – Conor O’Shea and Kieran McCarthy. This enabled a formal Memo of Understanding to be put in place, governing the relationship between LIARFC and the professional club; this agreement remains in place today. LIARFC funding was somewhat difficult in the early seasons. The arrival in 1998 of the RFU Insurance bill for £860 led to Messrs. Kane, Teague, and Gilligan having to make unplanned loans of £200 each to the club. Fortunately, the London Irish Golf Society, chaired by the much cherished Ken Dexter, stepped in to cover the cost. (2) The Amateur Club has always held traditional links with the London Irish Golf Society. To qualify for membership of the Golf Society, one must be either a member of the Amateur Club or a shareholder in London Irish Holdings. The Society continues to support the Club, on a year-by-year basis, but without that initial donation the eventual outcome could have been very different. On the playing front, from 1996 to 1999, amateur adult players within the broad spectrum of ‘London Irish Rugby’ played friendly fixtures only, and it was with regret that what should have been the Amateur Club’s Centenary season was not celebrated in the ubiquitous manner that had been hoped. However, the age-old tradition of Honours Ties was still adhered to, given out by 3 or 4 teams per season. A rather low point was reached in early 1998 when formal coaching was reintroduced: only 6 players turned up! In 1998-99, the famous historical name of ‘the Wild Geese’ was used again to denote the ‘1st XV’ of the amateur club, and for this former London Irish 1st XV tight-head – Alex Newberry – must be given credit for. It was not until 1999 that the club was officially reconstituted, under the RFU umbrella, as London Irish Amateur Rugby Football Club, to enable competitive rugby to take place under this banner. NB It is more than coincidental that the original London Irish club (1898-1996) had been “amateur” in every sense! The first President of the newly reconstituted club was former Ireland international No.8, Michael Gibson, and the Chairman was Chris Kane. In what must be seen as a historic AGM in September 1999, it was stated that (a) the relationship between LIH and the Amateur section was now defined, (b) a Memorandum of Understanding had been agreed, and (c) this establishes an autonomous amateur club within the overall London Irish family. (3) In what was an initiative promoted by the Wasps President then, the Wild Geese played, in the 1999-2000 season, in a Merit Table comprising other amateur teams who had been sidelined by the elevation (if that is the right word) of their clubs to the professional ranks e.g. London Scottish, Richmond. A crucial end-of-season tour to the USA had an uplifting effect: to quote one source – “we went as a bunch of individuals and came back as a team”. It must be noted that the tour would not have been possible without the generous sponsorship arranged by club member, Billy Murray. The club made application to Surrey County RFU in January 2000, who were very supportive of this application; acknowledgement should be made of the help received from Farnham RFC, and John Vale of Surrey, in this respect. (4) The club re-entered RFU competitive rugby in season 2000-01: in the case of the Wild Geese at the level of Surrey League 1, under the stewardship of club stalwarts Alex Newberry, Gerry Holland (coaches), and Bosco McAuliffe (manager) – all later to be honoured by being elected Club Presidents. The club’s remit of adult teams at this time included the Wanderers (representing the club in the afore-mentioned Merit Table), the A2s, the Bs (veterans), and an U19 XV. It took three full seasons in Surrey League 1 before promotion was, at last, achieved by the Wild Geese at the end of season 2002-03. This was swiftly followed by promotion from London Division 4 in season 2003-04. A further period of relative stagnation in London 3 then resurfaced, for three seasons again, until promotion was achieved in 2006-07 to London 2. 2007-08 witnessed the one poor season on record (only two wins), with relegation back to London 3. However, immediate promotion was assured for season 2009-10, to London 2, from which there was be no turning back. In season 2010-11, the Wild Geese achieved instant success with promotion from London 1 to the seemingly dizzy heights of the National Leagues. They started in National 3 (London & South East) but had to switch, in the following season, to National 3 (South West) due to geographical requirements. The 2012-13 season produced its own success story; the Wild Geese secured promotion to National League 2 at the first attempt, losing only one game in the process. (9) Unfortunately, the 2013-14 season saw the Wild Geese endure relegation, albeit by the narrowest of margins, their standing in the league being more than justified by, for example, two outstanding displays against the eventual champions (Hartpury College). Relegation to National Division 3 in 2014 was by one point, and – to add to the frustration felt – the Wild Geese just failed to make the promotion play-off, by one point again, in season 2014-15. In season 2001-02, the title of Head Coach was introduced and Martin Collins took on the mantle. He held the position with distinction for three seasons and was succeeded by Phil Rice (a former Wild Geese Captain) for season 2004-05. Bert Merritt took on the role for two seasons – 2005-06 and 2007-08. He was interspersed by Jon Bates in 2006-07. Jamie Balls MBE saw out the decade, being a highly successful Head Coach from 2008-09 for four seasons, interrupted by his duties in Iraq in season 2010-11, when Paul Dunne took over. This period witnessed the appointment of a former club player, coach, and manager – Chris Magowan – as Director of Rugby in 2008: a post he held until late 2013. To succeed Jamie Balls, the club appointed New Zealander Bevan Lynch (fresh from a successful sojourn at the City of Derry club) as Head Coach for 2012-13. For 2014-15, Duncan Cormack (a former London Irish player) becomes Head Coach, having been Assistant Coach in 2012-13 and joint Coach, alongside Jack Heald (a London Irish Academy coach), in 2013-14. Mention must be made of the first Captain of the Wild Geese on reformation – Andy Madill – who made a substantial contribution to the redevelopment of the XV. Other players of note for the Wild Geese during the Noughties included lock forward Ciaran Gannon and scrum-half Karl Becker (both still playing with the Bs), and locks Dave Peters and Dave Reilly. Of the recent crop of players, centre Lawrence Price was the Captain who led the Wild Geese to their most recent, and most prestigious, promotion, and No.8 Sam McKinney (son of the legendary London Irish, Ireland, and Lions blind-side flanker Stuart), who gained his honours tie in 2005-06, is still featuring strongly up to the present day. Captain for the past two seasons (2013/14/15) has been prop Eddie Fraher. In what is a large club by any standards (6 adult, 6 junior, and 6 age-groups of mini teams), administration is set in an Executive Committee of 10-12 people, elected annually. Representation is streamlined to occasion efficiency, with one representative from each playing sector of the club e.g. Mini Rugby, apart from the main Chair/Secretary/Treasurer officers. The Executive meets on a monthly basis. It is worth recording the fact that, since reconstitution, there have only been four Chairmen i.e. Chris Kane (1999-2003), Jack Costelloe (2003-06), John Gilligan (2006-09), and David FitzGerald (2009 on); the last named was a distinguished Club Captain of London Irish in seasons 1988/89 and 1989/1990. Secretaries and Treasurers have also been notable by their continuity and it would only be right to mention Ray McLennan, Terry Long, and Michael Connole in this respect. The current President is Alan McCartney. The Trust, under the chairmanship of John Gilligan, was set up in the aftermath of Vinny Culhane’s serious injury in 2002. (The Trust committee also comprised Julie Gilligan, Chris Kane, Loreto Kane, Patrick Kiely, Michael Gibson, and Cathal Leonard.) Vinny was aged 24 and playing at prop for the Wild Geese when the injury occurred; he nearly died as a result of his injury but it resulted in leaving him with a condition known as tetraplegia. The Honours Tie Dinner has been running annually since 2000 and was so named to distinguish it as a clearly Amateur Club occasion (as distinct from its predecessor – the London Irish Club Dinner). The driving force behind its ongoing success have been long-standing club member Peter Whiteside (another to be honoured by being elected Club President), Michael Gibson, and – more recently – Sean Ryan. A notable occurrence was the holding of the Honours Tie Dinner – now renamed as the Annual Dinner! – in May 2015 in our new facilities at Hazelwood. The Leprechaun Lunch was started in 1972 by Charles Byrne but lapsed for some years before being reinstated in 2001, at Trinity House on Tower Hill in London. March 2015 saw the 33rd Lunch and the 13th successive on Tower Hill. Again, a driving force behind it has been John Walsh, the immediate past Club President. The club also provides other notable social occasions, such as the Past Players Lunch and the Ladies Lunch, both being held at Sunbury/Hazelwood. The major development before the start of the past season was the move to a new rugby centre in Hazelwood (Sunbury). This move has been a resounding success to date, both in terms of the playing surfaces – both qualitatively and quantitatively – and increase in commercial opportunities. The move resulted in the appointment of a General Manager of Hazelwood – Nicola Browne – to assist both clubs in their commercial endeavours. Hazelwood is a joint venture with the professional club and, it is trusted, will put the seal on what is referred to as ‘the London Irish family’. The agreement by both parties is set out in a Heads of Terms document, dated August 2009. (8) Importantly, LIARFC became a Company Limited by Guarantee on 19th January 2010. In recent years, the interface with the professional club has shown a healthy mutual respect. 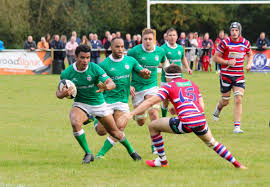 Due to the standard reached via Wild Geese promotions, Wild Geese players have appeared regularly in A League (2nd XV) fixtures for London Irish, with Academy players from the professional club appearing for the Wild Geese while in National Division 2. The club (as distinct from the Wild Geese) continues to thrive, with the Wanderers, the Bohemians, the Nomads, the Bs (veterans), and Wolfhounds (U21 & U19) XVs, all adding their own lustre to the club. Indeed, the Bs keep an age-old rugby tradition alive by embarking on annual end-of-season tours to various parts of Europe, from Sofia in the East, to San Sebastian in the West, to Istanbul in the South. The Junior and Mini sections continue to flourish, with U18s down to U13s in the former, and U12s down to U7s in the latter. The club’s Mini Festival has become a legendary event – the biggest of its kind in Britain and Ireland – and attracts teams both from these islands and beyond. Mention must be made of the annual support for the Festival received from The Irish Emigrant Support Programme, courtesy of Jim O’Hara’s endeavours; it has come a long way since the first Festival, organised by Paddy Hughes in 1981. 1. LIRFC Amateur Rugby Section: Proposed Organisation Structure. November 1997. 2. Letters from Chris Kane (Chairman, LIRFC Amateur Section) to the London Irish Golf Society. November 1998. 3. London Irish Amateur Rugby Football Club: General Meeting. September 1999. 4. Application for Affiliation to Surrey County RFU. 21 January 2000. 5. Save our Grandstand Campaign. 23 February 2001. 6. Press release: The Vinny Culhane Benefit Evening. 26 January 2005. 7. Letters from John Gilligan (Chairman, LIARFC) to the President and Chief Executive of the IRFU re affiliation. June/July 2007. 8. London Irish Holdings & London Irish ARFC (2009). Heads of Terms (re Hazelwood). 13 August. 9. Hunter, John S (2013). The Wild Geese gain a deserved promotion. The Irish Post, 17 April.